Celebrate Draw A Dinosaur Day with Dreams Resorts & Spas For Your Chance to Win! Did you know? It’s National Draw a Dinosaur Day! At Dreams® Resorts & Spas, we want to put your drawing skills to the test for a chance to win a FREE family vacation! Grab your crayons and the best artist in your family, because this is a contest you’re going to want to win! Read on for more information on our latest contest! Happy National Draw a Dinosaur Day from Dreams Resorts & Spas! Discover Dreams For a Chance to Win a Vacation to the All-New Dreams Dominicus La Romana! From the Explorer’s Club and the daily activities to the world-class spa and the gourmet cuisine there are endless ways that you can “discover” Dreams® Resorts & Spas during your stay. Want to discover Dreams for yourself? Keep reading to learn how you can win a vacation for up to four to discover the all-new Dreams Dominicus La Romana! Enter to win a free vacation to the all-new Dreams Dominicus La Romana when you enter the Discover Dreams Pinterest Contest. At Dreams® Resorts & Spas three is your new lucky number! Not only can you save up to 50% off your fall or winter stay when you book with our Triple Play special offer, but you can also enter to win a free stay, vacation upgrades and air credits! Keep reading to learn how to take advantage of this incredible sale PLUS enter to win these amazing prizes. Book with Triple Play and enjoy up to 50% off your fall or winter stay at Dreams Resorts & Spas! Take the Ultimate Costa Rica Vacation Challenge! Are you up for the challenge? In honor of #BeachThursday, we’re excited to challenge all of our fans to participate in The Ultimate Costa Rica Vacation Challenge by Dreams Resorts & Spas! By participating in the challenge, one lucky fan will win a five day, four night vacation to Dreams Las Mareas Costa Rica! Dreams Las Mareas is the newest vibrant beach getaway for couples, families and singles to enjoy all the inclusions of an Unlimited-Luxury® escape in a privileged location. Located on an expansive palm-studded beach and surrounded by lush green mountains & jungles on Playa El Jobo in the Guanacaste region of Costa Rica, guests of all ages enjoy an action–packed vacation featuring water sports, land activities, and swimming pools while sunbathing or laying under a thatched palapa. Continue the fun into the evenings with live nightly entertainment, outdoor bars and lounges and so much more! An aerial view of Dreams Las Mareas Costa Rica. Ready to know more? Here’s how to Enter! Participants can post to their Spotlight app with #DreamsCostaRica to be entered to win. The fan with the most cumulative ‘Likes’ for all posts (participants can post up to 5 times per day) will win a 5 day, 4 night vacation to Dreams Las Mareas Costa Rica for two people for travel within one year of challenge winner announcement date (restrictions & blackout dates will apply) and a $500 total credit towards flights. Week One is Open To All! Upload your images with #DreamsCostaRica and tell us why you deserve a luxury stay at Dreams Las Mareas Costa Rica. Week Two is Open To All! Use the hashtag #DreamsCostaRica on your pics and tell us who you would have tag along on your vacation to Dreams Las Mareas Costa Rica. Week Three is Open To All! Enter your images and let us know what you would do on your vacation. Week Four, Top 50 Will Advance! In this final round, contestants will post their images and tell us how they will make this vacation a vacation they will never forget! 1st Place goes to the fan with the most likes in the Spotlight App for all posts during the month-long challenge! 2nd and 3rd Places will be judges’ pick and will receive shoutouts from Spotlight’s social feeds and a special Dreams Resorts & Spas Prize Pack! 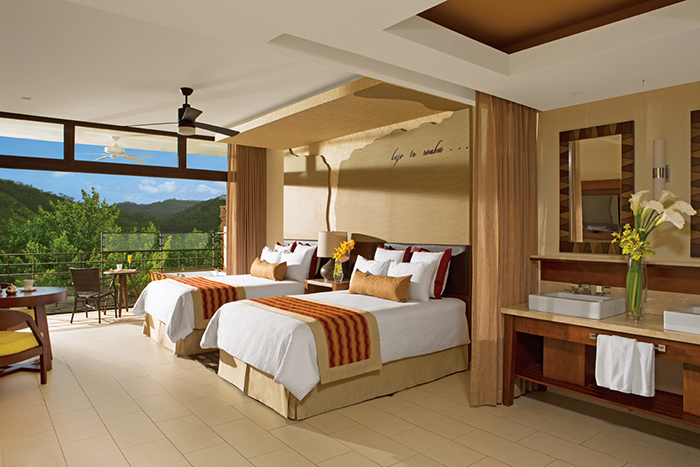 A stunning room at Dreams Las Mareas Costa Rica. What are you waiting for? Head over to the contest landing page, download the Spotlight app on your smartphone device and get ready to take the challenge! The contest runs now through 8 pm EST on Sunday, May 31, 2015 – we’ll see you soon at Dreams Las Mareas Costa Rica! Plus, we’re giving away a chance to win a 3-night Unlimited-Luxury® stay! Show us your idea of your Dream Destination Wedding on Pinterest to win – hurry, contest ends July 1st! Find the perfect Dreams resort for you, learn more about this promotion and contest, and book your destination wedding Here.